Multihull designers and safety experts around the world agree that FULL WIDTH bridles (shown above) should be used by multihulls for anchoring inshore and offshore in severe conditions. Because this bridle is secured to the extreme outboard tips of the strong hulls themselves it affords maximum leverage and security when it comes to keeping the yacht facing squarely into the seas. Ideally, catamarans should be set up at the factory with heavy duty, well backed up pad-eyes or rollers to accommodate a FULL WIDTH - ordinarily SYMMETRICAL - bridle. Many modern catamarans have a centrally located anchor roller situated amidships on the weakest part of the boat, i.e., the forward aluminum crossbar that holds the trampoline up. This arrangement may be convenient for casual anchoring in relatively stable conditions, but it is not advisable for storm anchoring. On some catamarans where there is a solid foredeck (notably Privilege and Prout) the problem is less critical. 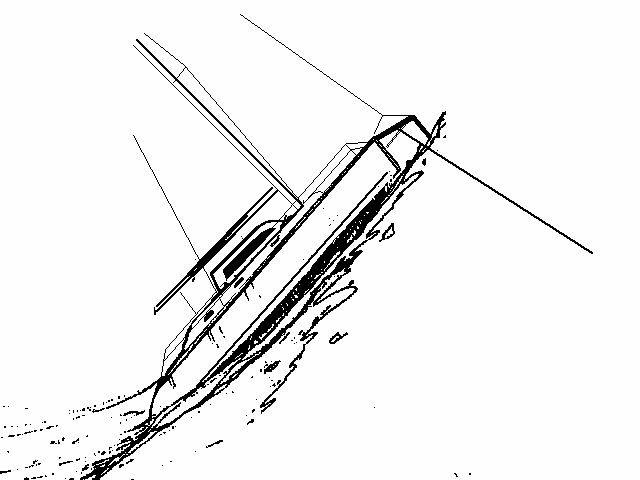 On other catamarans, however, leading a single line, or even the "half bridle" (shown above) through the center bow roller is not advisable. The aluminum crossbar that holds up the trampoline is usually far weaker than the mast. It is not uniformly braced like a mast, and many large holes have to be drilled into the middle of it to accommodate the anchor roller, and/or seagull striker. The severe up, down, outward and diagonal forces exerted by the anchor rode onto the middle of this relatively weak aluminum cross member (as the bows pitch acutely up and down in a storm) can cause it to fail, with serious consequences. At the very least the yacht will no longer face into the seas. In a worst case scenario, failure of the crossbar may lead to the loss of the entire mast and rig and/or capsize. It seems very likely that this was the cause of the capsize and ultimate loss of four lives from Bayette (S/C-19). Pitch-up attitude showing how an anchor line leading over the bow roller situated in the middle of the relatively weak aluminum cross member may buckle it downward. Note that the strong downward pull of the anchor on the aluminum cross member is being opposed by thousands of pounds of displacement load as the steep wave tries to "lift" the boat horizontally. This sort of scenario might easily be encountered in a storm while at regular anchor inshore, or at para-anchor offshore. Note also: should the aluminum cross member break and the yacht capsize, the anchor line will likely fall between the hulls, perhaps giving the impression that the yacht had pitchpoled backwards. In setting up your boat, make sure that the attachment points for the bridle as sufficiently strong. Some boats, such as the Robertson &Caine Leopards come with a very strong bracket on the inside aspect of each bow. Others may need some beefing up. See, for example, the custom built attachment points that Dave Abbott added to his Privilege catamaran Exit Only (scroll down to find the section on Sea Anchor Chainplates). And note, too, his comment that "Parachutes work extremely well on our catamaran". Hi. I own a 30 ton high windage fly bridge version and 2 roller furlers up front, of a Lagoon 52 sailing catamaran. With strong winds at anchor using the conventional cat bridle the cat yaws considerably like many monohulls. I would like to know if and how the Pardey bridle for a sea anchor can be used to keep it in a hov to position, considering the 2 bow points of a catamaran? That is a very interesting question to which I don’t know the answer! Perhaps the way to experiment on this would be to try out the Pardey bridle on a regular anchor some time? You might try putting the bridle to one bow, and then to the opposite stern, eg. port quarter plus starboard bow. That should give you some idea of how it might behave on a sea anchor. Please do report back with your experiences if you try this, as I have not heard of anyone else doing it – yet!